Following the journey of lubricants Morris Lubricants believes it is taking the lead in bringing users closer to engine oil than ever before. PMM finds out why. Imagine being able to see how oil flows through an engine, protecting critical mechanical components from wear and tear while cleaning and lubricating the entire system. Thanks to Augmented Reality (AR) and Morris Lubricants, there is no need to wonder anymore. The British manufacturer of oils and lubricants has developed a new app, taking you on a journey through the engine and explaining the important parts that are affected by the different oils you use. 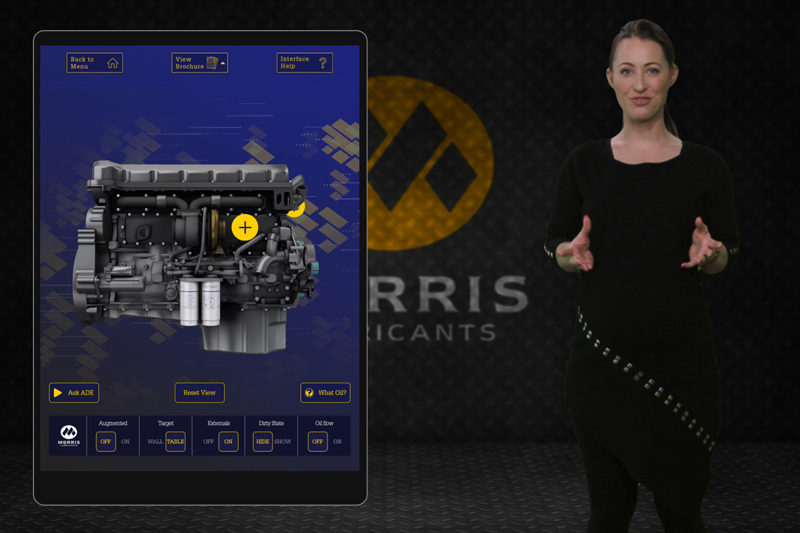 The campaign will include a series of adverts that will allow the augmented reality to come to life in the real world, enabling Morris Lubricants to show users over 150 years of experience in the industry. Your journey starts by looking at a 3D version of an engine and its externals, which you can turn to any angle to look at all the components. You can then view the inside of the engine and see how oil flows through the vehicle, lubricating and protecting. The internal combustion engine uses small, controlled explosions to generate the power needed to move a vehicle. These explosions, happening hundreds of times a minute, force pistons to move up and down a cylinder deep within. This generates the power needed to turn the vehicle’s wheels. To ensure the best power output, pistons run against the cylinder walls. In addition, many of the parts within the engine are made of metal for robustness. All these parts and many more require lubrication. However, modern oils also include cleaning agents to prevent particle build-up in key areas and keep the engine operating at peak efficiency. The app also shows you the dirty state of an engine and what happens if you select the wrong oil for your vehicle. The app immerses viewers in the very heart of the engine and gives two views, an overall external image together with details on turbochargers – fast becoming a standard addition to modern vehicles – as well as information on after-treatments and engine cleanliness. The internal view offers users the chance to follow a Morris Lubricants product as it flows through the system. This gives users the opportunity to understand what is a crucial, yet sometimes overlooked, part of vehicle maintenance. Until now, the only people who can understand how oil moves through an engine are experts in the field. The new app opens this view to a wider range of people, offering the chance to learn not only the science but how proper and effective care of the engine, together with using the correct quality lubricant, can improve performance, consumption and overall engine life. Morris Lubricants will also be using the app to present its popular ‘Ask Ade’ video series to a new audience. The media sees the company’s technical guru, Adrian Hill, who is also Morris’s Automotive Product Manager, advise on the latest updates and information in the lubricants industry, as well as answer problems that you might be unable to solve. The app is available for free on Apple’s App Store and Google Play, allowing it to be downloaded and used on a range of popular mobile devices. Previous : Is Your Business Ready for Making Tax Digital?